Bio: Rich Glor is a lifelong helper who developed his passion for reptiles and amphibians as a teenage volunteer at the Buffalo Zoo and later as a member of the Cornell University Herpetological Society. He earned his PhD in Ecology and Evolutionary Biology at Washington University in St. Louis through work on the evolution of species richness in anole lizards. He conducted postdoctoral work at the University of California, Davis in the Center for Population Biology before spending several years as a professor at the University of Rochester. 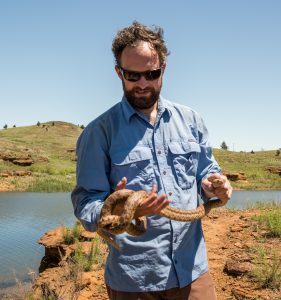 He joined the University of Kansas in 2014 as Associate Professor of Ecology and Evolutionary Biology and Associate Curator in the KU Biodiversity Institute and Natural History Museum. Glor has conducted field work across the Caribbean, Australia, and Madagascar. His current work is focused on how new species of lizards emerge in nature. Abstract: The forests behind the beaches on tropical islands are teeming with life, including many species found nowhere else on earth and others that remain to be discovered. Professor Richard Glor of the University of Kansas will discuss recent island discoveries made by researchers from KU’s Division of Herpetology, including dozens of colorful new frog species from Madagascar, a giant fruit eating lizard in the Phillippines, and an almost impossible to see chameleon-like lizard found in a single valley on a single Caribbean island.